When someone grasps an object, this motion can actually be broken down into two separate actions: reaching their hand out toward the object, and closing their hand around it. A lesion in the lateral corticospinal tract will interfere mostly with closing the hand around the object, but will have little effect on the reaching motion, which is controlled more by the ventromedial corticospinal tract. The spinal cord starts at the brain and descends through the vertebral column to the lower back. The spinal cord looks like a whitish rope, about the same diameter as your little finger and about 45 cm long. 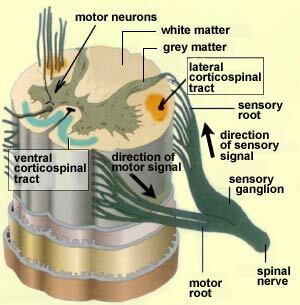 On the two sides of the spinal cord, 31 pairs of nerves emerge, consisting of the axons of its motor neurons. The nerves that emerge at shoulder level innervate the muscles of the arms and hands. Those that emerge in the lower back innervate the muscles of the legs and feet. This explains why some people lose the use of their legs when their spinal cord is severed at the lower back. The only neural pathway between the legs and the brain has been cut, so such people can neither move their legs nor feel them. Other people are still more unfortunate, losing the use of their arms as well as their legs when their spinal cords are severed at neck level. The pyramidal neurons of the primary motor cortex were first described by anatomist Vladimir Betz in 1874, and they are still referred to as Betz cells. These neurons receive their inputs mainly from Area 6, which lies immediately in front of them, and from the somatosensory cortex, which lies immediately behind. 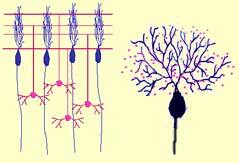 Betz cells also receive large numbers of axons from the thalamus. In contrast, the axons that these pyramidal neurons send out must travel a considerable distance to reach their targets: the motor neurons in the brainstem and the spinal cord. We therefore distinguish two descending pyramidal tracts that are responsible for voluntary movements. The corticobulbar tract leads to the motor neurons in the nuclei of the brainstem. These nuclei stimulate the muscles of the face, jaw, tongue, and pharynx, via the cranial nerves. The other descending pyramidal tract, the corticospinal tract, stimulates the motor neurons in the spinal cord that are responsible for moving the body's axial muscles, as well as the arms and legs. The corticospinal tract follows two different pathways to descend into the spinal cord. The first, called the lateral system, contains the axons of the cortical neurons that are responsible for the muscles of the extremities. The fibres in this bundle pass over the ventral surface of the brainstem to form two eminences called the pyramids. Next, at the junction between the medulla and the spinal cord, the fibres of this lateral corticospinal tract cross the midline and continue their descent on the opposite side of the spinal cord. About 80 to 90% of the axons from the motor cortex undergo this crossover, or decussation, before reaching the motor neurons responsible for the movement of the most distal segments of the arms and legs. The other pathway followed by the corticospinal tract is called the ventromedial system. This system begins in the cortical motor neurons that control the body's axial muscles. This ventral corticospinal tract is composed 10 to 20% of cortical axons . Unlike the lateral system, the ventromedial system does not change sides when it enters the spinal cord, whence its other name, the direct pyramidal tract (as opposed to the crossed pyramidal tract). It descends fairly directly into the ventral and medial part of the spinal cord, where it connects to the motor neurons that innervate the axial muscles and the proximal segments of the arms and legs. These two major systems are divided even further into various bundles that follow different paths and play distinct roles. Some body movements have both a reflex component and a voluntary component. Many of them are rhythmic movements such as breathing, chewing, and walking. 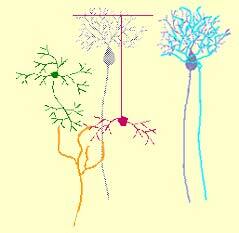 These movements are produced by neural circuits called central pattern generators. When activated, the neurons in these circuits generate a certain pattern of predetermined neural activity that smoothly co-ordinates the contraction of the many muscles involved in rhythmic activities such as walking. These pattern generators free up your conscious mind so that you don't have to send down a voluntary command every time you want to put one foot in front of the other. In this respect, walking resembles a reflex activity. But you do have to issue voluntary commands when you want to start or stop walking, just as you do to pick up your pace to get across the street when the light turns yellow, or to make that little jump up to the curb on the opposite side, or a small sidestep to avoid a puddle along the way. Thus voluntary commands can also modulate certain reflex movements. This is the most effective compromise that nature has found between the need to free our minds from repetitive movements and the need to retain some ability to adjust to changes and obstacles in our environment. The cerebellar cortex is composed of three layers of cells. Proceeding from the outside in, they are the molecular layer, the Purkinje cell layer, and the granular cell layer (or simply the granular layer). The molecular layer is composed of inhibitory interneurons known as stellate cells and basket cells. The stellate cells are located in the surface portion of the molecular layer (the black horizontal cell in the lower diagram here represents a stellate cell). The basket cells are located deeper down in this layer (like the black cell running diagonally in this diagram). The basket cells' lower position lets them synapse on the bodies of the cells in the next layer down, the Purkinje cell layer. 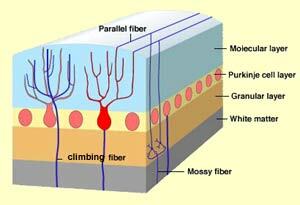 It is also in the molecular layer that the axons of the granular cells divide in two to become parallel fibres. As its name suggests, the Purkinje cell layer (the light purple cells in this diagram) consists basically of the aligned cell bodies of Purkinje cells. These cells deploy their elaborate networks of dendrites into the molecular layer, where they receive very special kinds of synapses from the climbing fibres and the parallel fibres, the two main inputs to the cerebellum. 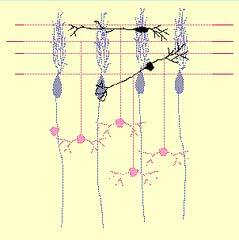 The axons of the Purkinje cells constitute the main output path for the information processed by the cerebellar cortex. The granular layer contains the inhibitory Golgi cells (shown in green) and the excitatory granular cells (shown in red) which receive the information coming from the cerebral cortex and the spinal cord. This information reaches them by two kind of nerve fibres. One is the climbing fibres (shown in pale blue), which carry the information from the spinal cord; they get their name because they wind around the dendrites of the Purkinje cells like climbing vines around tree limbs. The other kind are the mossy fibres (in orange), which are excitatory axons of neurons in the pons that relay information from the cerebral cortex.